This group of rowhouses which extends east from Kent Street was designed for Leedom Sharp. 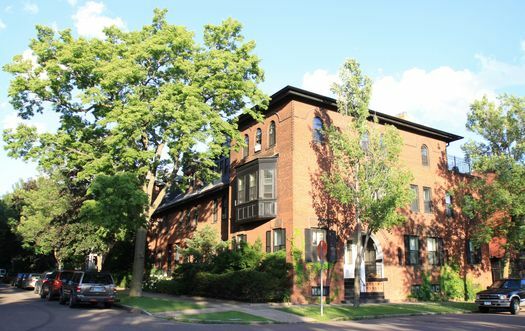 The row is one of the few surviving rowhouse groups in Saint Paul. Unlike East Coast cities, Saint Paul and Minneapolis never took to the building type, as both cities had an abundance of land on which to construct freestanding houses. 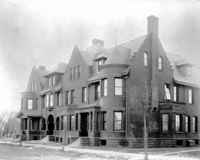 In Saint Paul, most rowhouses were built in areas adjacent to downtown and subsequently were razed for redevelopment. The Portland Terrace row is adjacent to a pair of houses Gilbert also designed for Sharp at 20-22 N. Kent Street, built in 1889. 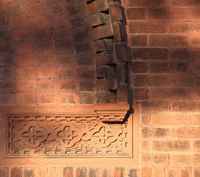 The design of the Portland Terrace and its Kent Street extension reveals a Richardsonian influence, particularly in the materials and massing and the recessed entry on Kent Street; however, many other details of the design are more English Queen Anne, especially the gables and dormers. 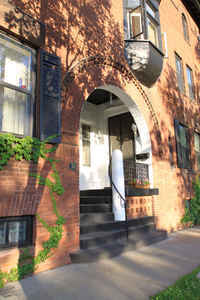 Recessed entrance on Kent Street.